Nielsen is a smart company. They study a lot of things. Then they use their studies to draw conclusions. At first you think, “Duh,” but then you realize just how true this observation really is. But which lever to pull these days is difficult. As Nielsen points out, the challenge of attracting, engaging and maintaining customers is rooted in three things: 1)product variety, 2)access to technology and 3)instant gratification – all which have become ubiquitous. The word “ubiquitous” is always one of the “beware-when-you-hear-it” words because people use it but may not know what it means and generally, use it incorrectly. Ubiquitous refers to something that is found everywhere, at the same time. Nielsen says product variety, access to technology and instant gratification are ubiquitous. Are they? Or do they mean that they have to be there concurrently? If you google “ubiquitous,” you’ll come up with absurd things people say are ubiquitous, like television. Even “air” which might seem ubiquitous, isn’t. It doesn’t exist in the ocean, so it is not found everywhere at the same time. Close, but not really. Regardless, in Nielsen’s usage, it’s a scary thought if true: that to get customers, you need product variety, technology and instant gratification all at the same time. It’s scary because frankly, I can’t name one area where those things are there at the same time. Maybe browsing the Internet? 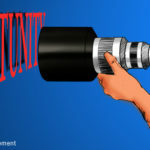 The Nielsen article, which is about the fast-moving consumer goods market, warns: you shouldn’t look at opportunity “with too large of a lens.” Because if you do, you won’t be able to attract, engage and maintain customers. In other words, you didn’t have product variety, technology and instant gratification because your lens was too wide. Across traditional U.S. retail, Nielsen sees revenue growth wasn’t able to hit half a percent last year. Companies focused too wide. Revenue growth was just 1% in 2016, down almost 150% from 2015, when revenue growth came in at 2.4%. Nielsen’s 2020 forecast highlights a 1% revenue drop for the grocery, drug and mass merchandise channels. According to our research, for example, the path to purchase is littered with products that don’t make it because of their wide-lens focus. The old saying – you can’t please everyone – comes to mind, but in trying to do that, you lose everyone. One former client went so wide, they lost their core competency and now two major competitors are the preferred brand of architects in a narrow category they once dominated. Another company believed they had to compete with two new competitors and completely neglected their installed base, moving so wide from their “expert zone” that they now resemble a third-world manufacturer instead of the market leader in that category they once were. Still another bet the ranch on new technology thinking it would help narrow his focus because it was an “attribute” the customer wanted. They overlooked one thing: timing. In the two years it took to bring the product to market, competitors brought theirs and left them in the dust to play catchup. As Nielsen pointed out, the key to success is looking for product attributes that a customer wants, which is usually a narrow focus. They use ice cream as their example, and point out that revenue growth among ice cream qualifying as a “good source of protein” increased more than 53% last year. But that sub-category – “good source of protein” is only 3% of total ice cream category sales! Talk about narrow. But, there is the problem with a laser in marketing: it’s too precise. Think of a flashlight compared to a laser. If you have a small, highly centralized beam of light, you can ONLY see what you target. The laser doesn’t even light anything: it points. A flashlight throws a traditional beam, with the middle still brighter, but you also see what’s around the projection, so you don’t fall down when you walk. It points AND lights. The question for your business data is, do you need a laser or a flashlight? Because the bottom line is, it’s always been about giving customers what they want, not what you think they want. And that means being able to go narrow or wide when your customer wants to, not when you want to. But that’s hard, isn’t it? It means being able to admit that the customer is always right. That’s hard to do for many companies who have been successful for a long period of time. Those companies get to thinking they know what’s best for the customer. But if they do that for any length of time, they find out they are not, after all, so smart. Neglecting to give customers what they want is not sustainable for a business. It never was nor ever will be. So Nielsen is right: look for the product attributes that a customer wants. And then give it to them. Pretty simple when you think about it. We’re here to help. Let us know how we can do that.